This is the second installment of a four-part look-back on the Boston-Haifa Connection’s inaugural Hatikvah Mission, written by Ken Kaplan. For all those who attended Boston’s commemoration of Yom HaShoah at Faneuil Hall, the profound emotion and power of the moment were evident. Danny Nishlis, the Haifa co-chair, said that for him it was unquestionably the highlight of the week. 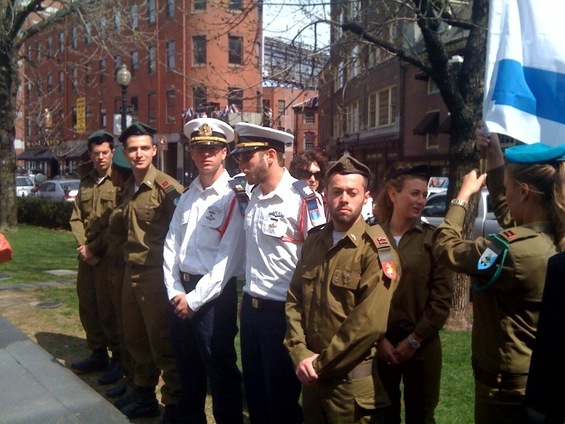 Eight of the 12 soldiers represented Israel that morning in the hall, facing the Israeli flag and the crowd. An estimated 600 people were in attendance, schoolchildren and grandparents, survivors and members of diverse faith groups, military veterans and activists wearing Save Darfur T-shirts. The event drew many from outside Boston as well. Linda Bernell, a resident of New York City, who was in town that weekend to visit her daughter, attended with her son-in-law. Looking down from her seat in the balcony, Bernell, the daughter of survivors, told how her parents, as children, spent the war in hiding, her mother fleeing from country to country, from Germany to Belgium, her father the whole war in Belgium. Miraculously, she said, all her parents’ many siblings survived, though they dispersed to several countries after the war. The ceremony began with six blasts of a shofar, one for each million, and a minute of silence. Over the next 90 minutes, the crowd heard an impassioned exhortation for “good people to stand up for the truth” in support of Israel lest “evildoers triumph,” and a survivor’s heartbreaking account of personal loss, even after the camps were liberated. But for many, the moment, the scene that is emblazoned in memory, was during the singing of Hatikva: the eight young soldiers facing the crowd and saluting the Israeli flag, and in the crowd, three elderly US Jewish WWII veterans, at attention with their campaign ribbons on their chests and their veterans caps on their heads, saluting right back. 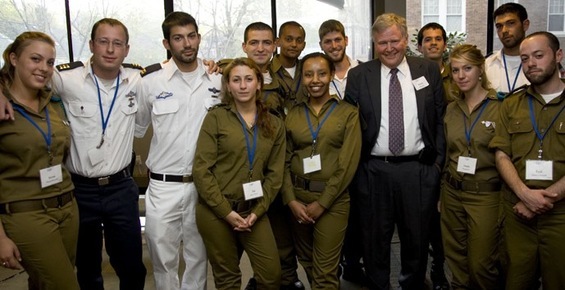 Shortly after the ceremony, CJP President Barry Shrage and Yuli Edelstein, Israel’s minister of Public Affairs and the Diaspora and former refusenik, addressed the soldiers at CJP’s offices. Shrage, recalling the efforts of the US Jewish community on behalf of Soviet Jewry more than 20 years ago, said “when we became involved in the Soviet Jewry movement, we did it to help Soviet Jews and Yuli and Natan [Sharansky], but what we really did is help ourselves. Because nothing strengthens our sense of being Jewish more than actually engaging in a whole wide process to help Jews in another part of the world. Edelstein, for his part, emphasized that it would be incumbent upon the officers to report back to their colleagues on the reality of what they had learned about Diaspora Jewry. The good and the bad. He spoke too of the value of linking the next generation of Israeli and Diaspora leaders so that when the day comes they are in positions of authority, they will have a lifetime of shared experiences to draw on in their collaborative efforts. Over time the American view of Israelis as Ari Ben Canaan-like heroes, and the Israeli view of Americans as “fat tourists taking pictures,” were “bound to disintegrate under close observation,’’ Shrage said. “So we said, beginning in 1990, that this couldn’t be the way we needed to be, we needed to get to know each other, or it was going to be all over. As it is, our cultures move in radically different directions. American Jews are becoming increasingly spiritual, interested in religious life … and any Israeli Jew who comes to this country and experiences religious freedom in this country has a very different view of the potential of Judaism. Shrage concluded by inviting the officers to define for themselves the degree of their involvement in programs bridging the gap between the communities. “For me,” Shrage said, “the big project is defining what it means to be a Jew in the 21st Century. Israeli Jew or an American Jew.” American Jewry, he said, is “right at the edge of huge, major changes” that affect relations with Israel. On the one hand is the Birthright program, which brings thousands of young Jews to Israel every year. On another is the fact that 50 percent of American Jews are now living in interfaith households, though it is not, he said emphatically, destroying their identity as Jews. “Many of these families are struggling to define themselves as Jews,” he said. “Now, inevitably, this is going to mean Judaism as spirituality and religion, because for the non-Jewish spouse the idea of peoplehood — until the non-Jewish spouse gets to Israel — is a very abstract idea.